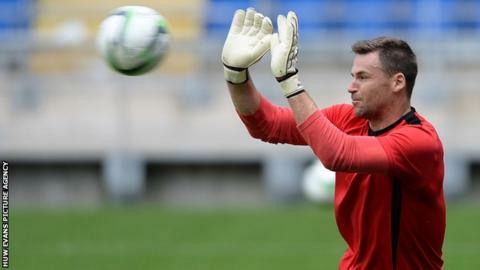 Manager Russell Slade remains hopeful of goalkeeper David Marshall staying with Championship side Cardiff City. West Bromwich Albion have made a bid for the 30-year-old Scotland international but have not met Cardiff's valuation, thought to be £5m. Slade hinted that the Premier League team have not returned to test Cardiff's resolve with a bigger offer. "It's very quiet, that's all I will say and long live the quietness," Slade told BBC Radio Wales. Marshall was sent off in the final game of last season and he has had to watch from the stands as Simon Moore deputised for him at the start of this season. But Marshall's three-match ban ended after Saturday's draw at Queen's Park Rangers and the Scot was restored to the side for Tuesday night's league trip to Blackburn, which ended 1-1. "Dave was desperate to get going again because he missed the first three games being suspended," Slade said. "He's a strong goalkeeper, he's got a great voice and he's got great experience. "To have that behind your back four [against Blackburn] where it was very direct against us, it was good to see him in good form." Cardiff have now drawn their first three Championship games of their season, at home to Fulham and then at QPR and Blackburn. "Probably it [the Blackburn game] wasn't the best performance out of the three," Slade added. "But as the away team to get in front, and look like we'd seen the game out at one stage was hard to take but we'll dust ourselves down, crack on and get that first win on Saturday. "We wanted more [than three draws] but the positive is that two of those were away from home... but at home we've got to treat it as a fortress." Cardiff now face Wolverhampton Wanderers at Cardiff City Stadium on Saturday. Bruno Manga and Federico Macheda have an outside chance of being involved in that game, as the pair have come through two training sessions following injury.